A Poster for Fists of Fury. Since the late nineteen twenties there has been an abundance of martial art related movies, ranging from outlandish fantasy (known in China as Wuxia), through gritty hard hitting drama to high concept action pieces. The majority of these have originated from either mainland China or Hong Kong, with the former generally focusing on historically orientated titles and the latter producing more modern, explosive fare. In this series I will be looking at a number of iconic Kung Fu films that, for one reason or another, had a significant effect on the way we watch martial arts on the cinema screen. Some of them are well known and have created certain expectations about the genre, while others are lesser known titles that have provided a different take on how to portray martial artists and their practices. However, all of them are based on Kung Fu first and foremost; different styles are on display, but Chinese martial arts are the centrepiece of each production. 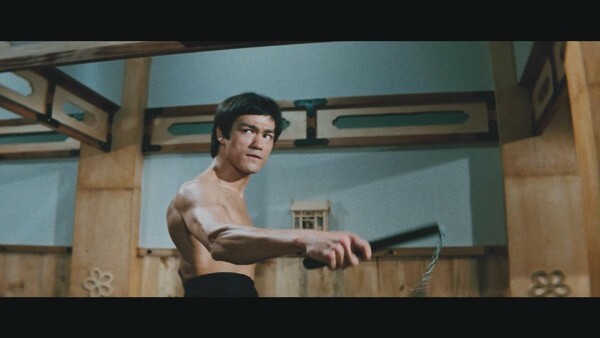 For the first part of this series I am writing about the 1972 Bruce Lee classic, Fist of Fury. Martial artist Chen Zhen (played by Bruce Lee) returns to his Shanghai training school to discover his master has recently passed away under suspicious circumstances. Facing aggression from a nearby Japanese school and little support from either the local authorities or his fellow students, Chen takes it on himself to confront the school’s enemies. Along the way, he uncovers the mystery of his teacher’s demise and falls into an unrelenting circle of violence. 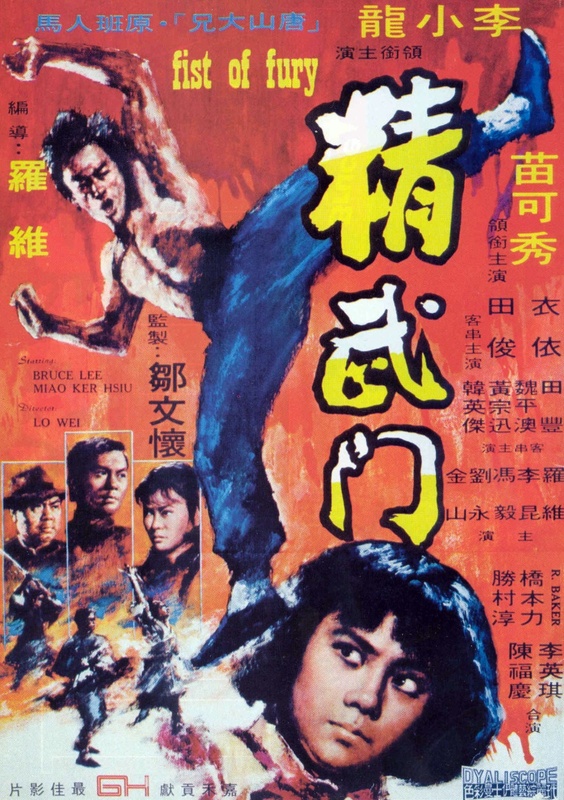 Having established itself as a dominant movie style in both mainland China and Hong Kong through the thirties onwards, the martial arts film slowly started to incorporate a number of clichés and idioms that helped to define the genre but also threatened to leave it in a creative rut of sorts. The more commercially successful titles could get by on lean, bare bones plotting that was there to string together as many fight scenes as logically possible. Themes of loyalty and revenge were commonplace, as these would offer a quick and easy set up for a main character to justify numerous battles without compromising their moral core. On top of this, a personal vendetta storyline does not run the risk of taking on overly political tones, which would allow the film to be shown across China without running the risk of being heavily edited by censors, or banned from distribution. Xu Haofeng, the professor of the Beijing Film Academy and a writer on Wong Kar Wai’s recent Wing Chun centred film The Grandmasters, spoke out about this at the recent 2013 Busan International Film Festival Forum: “the martial arts films previously were always telling a very simple story – the revenge. The only factor that can absorb the audience is the splendid actions, which is the mainstream of Chinese martial films in the past 20 years.” His point cuts straight to the heart of the problem; whilst it is easy to loosely link together a number of expertly choreographed fight sequences, what is going to hold the audience’s attention whilst they’re waiting for the next exchange of blows? This trend for streamlined story and emphasised action goes back to the sixties, when the genre really started to find its footing. The Chinese Cultural Revolution had suppressed the mainland film industry, only allowing a narrow scope for filmmakers to work in, and violent action stories were not on the list of acceptable subjects to base a movie on. On top of that, traditional national fighting styles were viewed as representative of the previous governments that the Communist Party had opposed; the last thing that the authorities wanted to see was a hero of the silver screen emerging victorious against his or her enemies through use of Kung Fu, a symbol of the old guard. Despite the popularity of such titles, the Chinese cinema goers faced losing their tales of escapism. As such, Hong Kong responded by producing a wealth of high kicking features that delivered what fight fans wanted to see, flooding the market with a seemingly endless supply of avenging angels and historical heroes, all of which were well versed in various forms of martial arts. There was an inexhaustible amount of young martial artists and actors eager to break through, and even veteran actors – such as Lo Wei, who was an experienced actor prior to directing and starring in Fist Of Fury amongst others – viewed the work as worthy of their time and effort. Seemingly content with this production line approach to movies, things changed when Bruce Lee returned to Hong Kong following an unsuccessful attempt to break into the Hollywood movie industry. A few minor acting and fight choreography roles aside, his most recognisable work was as the black clad sidekick Kato in the hit US TV series The Green Hornet. Unaware of that series’ success in Asia, Lee was reluctant to leave America without securing a major role, but was eventually convinced to star in a number of films produced by Golden Harvest; at the time one of the most influential movie companies in the East, alongside the Shaw Brothers’ studio. Realising that he could boost his already considerable star power even more by being a big fish in (in his eyes) a small pond, this was Lee’s chance to demonstrate not only his on screen fighting prowess, but his acting skills and personal philosophies. Veteran director Lo Wei was quickly recruited to oversee the first of these films, replacing the previously assigned Ng Gar Seung, whilst Lee replaced lead actor James Tien. Opening to commercial and critical applause, The Big Boss announced that Hong Kong’s most prized export had returned to deliver the highest grossing film in the country’s history. And yet, whilst it played to the typical martial arts picture strengths and stereotypes that viewers wanted, were it not for its cast it would not have stood out. A top of his game director and the biggest star possible had worked together to deliver a high quality production, but the hype alone ensured that its success was a given. Lee’s next film, released only a year later, would focus all of the requisite elements of the fight film into a stellar example of the genre that is both a fantastic introduction to the style and also a favourite for fans as well. 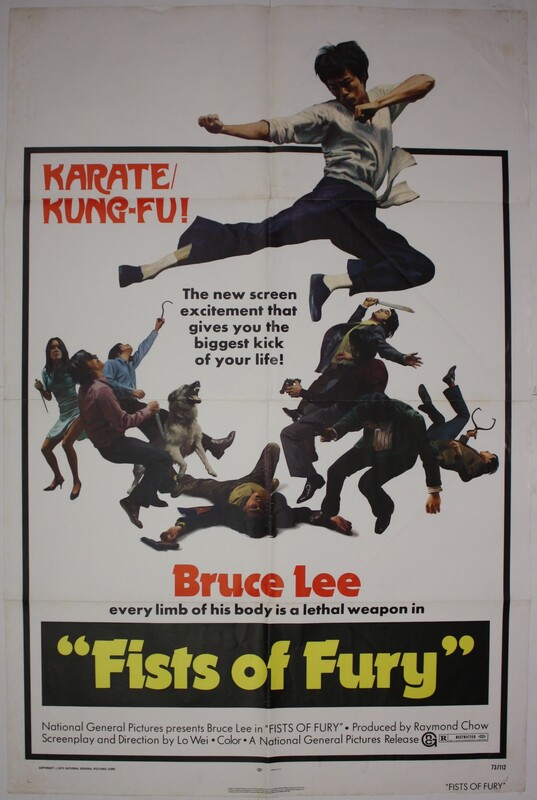 Vintage poster for the American release of Fists of Fury, originally produced for the Hong Kong market. Opening with Chinese text displayed in an Andy Warhol-esque title sequence and backed by a Morricone/cowboy themed soundtrack, the film immediately shows its hand as an amalgamation of Eastern and Western ideas – this movie was aimed at every possible demographic in mind. Chinese viewers would enjoy the cultural pride that the script contains, Hong Kong audiences came to marvel at Bruce Lee’s ascending status, and Western audiences were catered for with its style and presentation. Indeed, the US title was originally The Chinese Connection, simply to cash in on The French Connection, the completely unrelated Gene Hackman movie released the year before. Over the years the title has changed numerous times, from Fist Of Fury to The Chinese Connection, to The Iron Hand and back to it’s original name. Set in 1933, Lee stars as Chen Zhen, a student of real life Kung Fu master Huo Yuanjia, himself a Chinese folk hero due to his martial prowess and status as a devout defender of the Chinese national identity at a time when it was under threat from the combined influences of both Europe and Japan. Huo Yuanjia has featured in numerous period martial art films such as Jet Li’s Fearless; his Chin Woo Athletic Association upheld the teaching of traditional styles, and its reputation was so revered that even during the Cultural Revolution’s purging of the old fighting methods it was to survive, now renowned as a popular Wushu school. In the story however, Chen Zhen returns from his travels to discover his master recently deceased, interrupting the funeral in a dramatic, agonising manner. There are as many theories as to Huo’s death as there are Lee’s, which only adds to the poignancy of the scene. Lo Wei had chosen one of the more sensational beliefs, which is highlighted as the film unwinds. From this initial scene, Lee is given the chance to stretch his acting muscles, working through grief, anger, contrition – Chen is torn apart from the very beginning and spends the rest of the film reeling from the loss of his master, who would have been a significant father figure to him. In fact, the Kung Fu school is the only sort of family that Chen has, and his fellow students even say as much to him to help in his time of need. Later on, he even gets to show his softer side in the few scenes that he shares with leading actress Nora Miao, where their relationship is slowly revealed more and more with each conversation that the characters have in private. And this is unusual for a film where the main appeal is in the fighting – whereas the majority of Kung Fu films’ scripts are focused on moving from one confrontation to the next as quickly and efficiently as possible, Fist Of Fury isn’t. Rather than rush through the events and risk poor characterisation or creating plot holes, it instead escalates the tension, holding back on battles like a thriller. Faced with a mocking, overly aggressive Japanese martial school trying to close down his master’s school, Chen plays a game of cat and mouse with them, slowly raising the stakes with each meeting – first a painfully fraught battle of words, next a brief yet explosive skirmish with its students, and so on until he inevitably uncovers the reason for his master’s death and who is responsible. The use of a murder mystery setting helps add to the overall feel of a production that takes from the crime/thriller genre whilst refining what fans of the fight movie wanted to see. Due to this, there aren’t as many clashes as in other movies, but is all the more satisfying for it. Drawing the viewer into the circle of violence by showing a strong, honourable man being seemingly dragged into a war that he doesn’t want, Lo Wei ensured that his script played on the cultural themes of the time, having his Japanese villains use the term “sick man of Asia” as an insult; a phrase that was used at the time that the film was set in. Also, being only six years before the outbreak of the Second World War, Chinese viewers knew that racial tension was at an all time high. Amidst all of this, Chen’s quest for vengeance takes him down an increasingly dark path, causing him to break the law and alienate not only foreigners and officials, but his own friends. Despite this, Lee’s charisma keeps us cheering him on. Whilst the other students do little to nothing to stop their Japanese nemesis, Chen struggles to accept their (and his master’s) theory of non-confrontation, when he has spent a lifetime training in martial arts. It’s rare that a martial arts film shows this side of a fighting style’s philosophy, as it normally reduces the number of on screen strikes and blows, but here we see Chen genuinely struggle to follow his teachings when all around him everything and everyone he cares for is under some sort of attack. 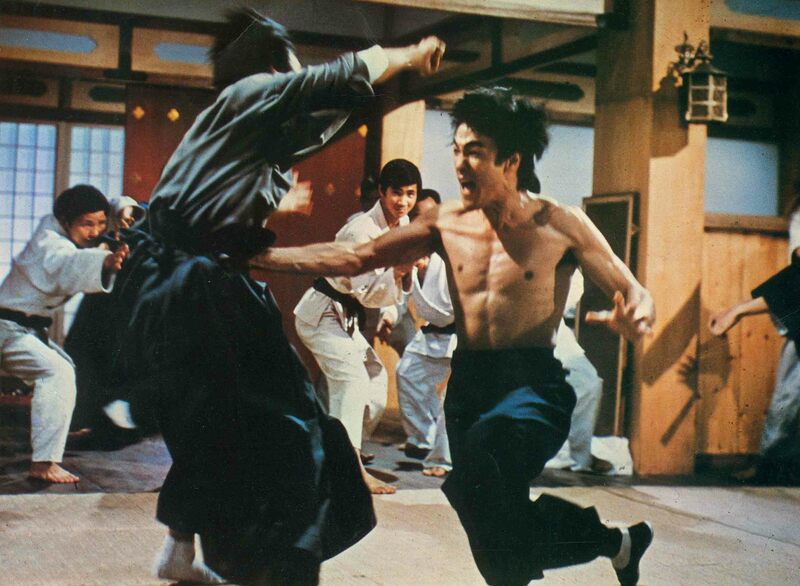 During the course of the film, the fight choreography uses a mix of differing Chinese and Japanese styles, not necessarily sticking to what the characters would have been using at the time. Plot wise the two opposing schools call for examples of Wing Chun from Huo’s students, whilst the Japanese school demonstrate a mix of Judo throws and holds, with Karate strikes. Using a modified take on his own personal philosophy towards combat – off screen he would go for the most efficient moves, on screen the best looking – Lee instead utilises techniques that look more cinematic than realistic. After all, his famous one inch punch wouldn’t impress most non-martial artists as much as a jumping sidekick combined with his legendary battle cry. Smooth blocking motions and lightning fast counter punches are the order of the day, with graceful series of spinning kicks (often aimed at head height) used to keep a fluid, dynamic feel to his movements. Reaching its bloody conclusion, whereby Chen faces off against a Russian strongman and an armed Japanese sensei, the film ends with Chen having to pay for his crimes despite his apparent victory over, well, everyone who opposes him. We see him being repeatedly warned by his colleagues as well as Lo Wei’s detective, who try to help him see that his rampage will only end up hurting his family as much as his enemies, and his being punished for his actions is very typical of Chinese martial tales. Whilst this isn’t typically seen in Hollywood productions, Lee ends the film in a typically defiant way, both accepting his fate while going out in a dramatic, defiant way. So, why have I chosen this particular Bruce Lee film to write about as opposed to his other works? Whilst The Big Boss, Way Of The Dragon, Enter The Dragon and Game Of Death all feature similar motifs (forced confrontation, revenge, justice), Fist Of Fury was the right production for the right time. Lee had already begun to establish his reputation as a fearsome martial artist and fight choreographer, and The Big Boss’ success meant that people were avidly awaiting this title. On top of that, the tense, streamlined script builds up anticipation of the fights as well as showing more rounded, fleshed out characters in contrast to two dimensional heroes and villains that tend to populate the genre. And even to this day the combat is hard hitting, thanks to its focus on small numbered hand to hand exchanges; the setting allows the story to ignore the threat of guns and also emphasizes why a fighter had to have good martial training in a day and age where violence was never far away. Look at the other films around at the same time: Hong Kong was churning out a relentless number of high concept fight films, content to deliver functional stories that gave a sufficient pretense for as many scraps as they could. That way the immediate, distracting flash of action could distract the watcher from the plot holes, the lack of budget, or the poor acting. This foreshadows present day American (mainly Hollywood) business models in the film industry, making sure that there are few creative risks and large financial returns, which creates a rigid, overly conservative formula, and this is what Xu Haofeng is warning against even now. It’s easy to make a martial arts film, but its difficult to make a martial art film with drama, tension and artistic flair. Without the meteoric rise of Bruce Lee, and the resulting press attention that was bestowed on martial arts and their cinematic counterparts, audiences would have been inundated with second rate action titles that had no imagination and no respect for their viewers. Fist Of Fury is the iconic Bruce Lee role, providing a pitch perfect definition of what to expect from his acting and fighting styles. Built to further his own approach to Kung Fu as well as enhance his own reputation (and it could well be argued that it is hard to draw the line between these two, as fans of Lee will acknowledge), this was also a leading light in the refinement of modern day martial arts films, moving on from the generic fare that was being offered up after years of indolence towards what is now expected of a quality action movie. Yes it could be argued that Enter The Dragon is bigger and more well known, and that Game Of Death is more intriguing due to the circumstances of its making, but for a perfect demonstration of spectacular fight orchestration and dramatic plotting, I’d vote for Chen Zhen’s tale of vengeance each and every time. Rob Argent is a freelance writer with a degree in English language and literature. He has previously trained in Karate, Kickboxing and Muay Thai and he is currently studying Taiji Quan. He lives in Birmingham, England with his two pet fish.